UltraBoard now has a new look. The large format printing industry has a decades long relationship with UltraBoard and its extensive line of foam core products. 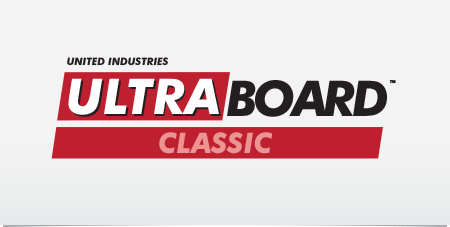 United Industries, manufacturers of UltraBoard, have invested the time and resources needed for a rebranding directive as they strive for recognition of brand across the foam core board industry. New branding will require transitioning from an industry-embedded logo to a new, fresh look; but still retain the brand name and recognition. To accomplish this, UltraBoard retained the angles of the original logo while consolidating the name into the single logotype “UltraBoard”. Utilizing the one-word naming convention also encourages specificity within web, search engine and branding results. This entry was posted in Industry News, Press Releases. Bookmark the permalink.